Is This “High Noon” For The Dow Jones Industrial Average? The weekly chart of the Dow Jones Industrial Average suggests that a showdown between bulls and bears is soon approaching. Does it surprise anyone that it appears to coincide with the elections and/or the “fiscal cliff”? It shouldn’t …but in this case the stakes are high. With the Dow Jones Industrial Average unable to break above key trend line resistance (currently at 13,675), and with doggedly persistence overbought conditions remaining on weekly chart, the odds favor a resolution to the downside technically. That being said, Q3 earning season has just begun with many analysts expecting to see aggregate profit growth decline for the first time since the financial crisis began in 2008. But have those expectations already been discounted in market prices? And is there a chance that a number of unexpected surprises could lift prices solidly higher? While current economic conditions are noticeably different from 2008, the IMF has just warned that a global economic slowdown would likely be more pronounced that previously thought. This is clearly another factor to deal with. Nevertheless, at this vantage point the elections are too close to call and a political agreement to address the “fiscal cliff” appears to be far, far away. Technically, a solid break above key resistance at 13,675 is needed to jumpstart the bullish case. A failure to do so would be disappointing to investors. Moreover, a break below steep upwardly sloping trend line support currently at 13,068 would make matters worse. It is worth noting that below key support at 13,068, major trend line support currently sits at 10,985 (but rises over time). A move down to that level, if it were to occur, would represent a nearly 20% drop from the recent high of 13,662. Most analysts agree that for the overall stock market to extend higher and for the economy to grow, a healthy banking system is a must. 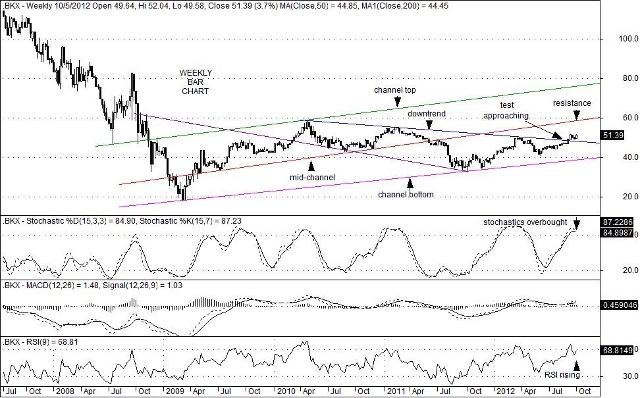 With that in mind, it is worth noting that the Keefe, Bruyette & Woods U.S. Bank Index (BKX) continued to move higher last week after breaking above key downtrend resistance at the 48 level. Since the Dow Jones Industrial Average has yet to break above its key trend line resistance (now sitting at 13,662), the recent upside “break” in the BKX index should be viewed as an important factor. And although the Dow Jones Transportation Index (DJT) continued to diverge bearishly from the Dow Jones Industrial Average (DJIA) on long-term charts, the transports did turn higher last week and outpaced the industrials to the upside. A strong performance by Presidential candidate Mitt Romney may have bolstered a more positive view of future economic conditions. A better-than-expected set of monthly employment data, good news on the housing front, stronger-than-expected factory orders and the reiteration by Mario Draghi of his commitment to the ECB’s intended bond-buying program also gave bank stocks a boost last week. That said, the elections are a still a month away giving plenty of time for political moods to swing both ways. Moreover, a compromise to deal with the “fiscal cliff” still seems to be unclear, particularly with the presidential election expected to be a neck-and-neck race. In any event, if the BKX can hold above former tend line resistance at 48 and extend higher, expectations for a rise in both the S&P 500 Index and Dow Jones Industrial Average could gain traction. 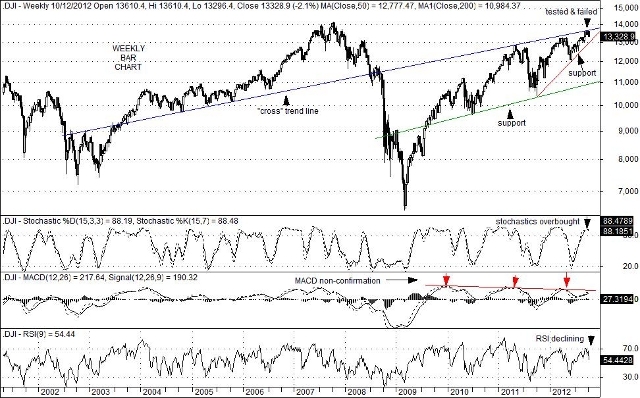 With overbought conditions currently present on weekly charts, a reversal back below trend line support would nevertheless be seen as a major concern, if it occurred. For now, however, bank stocks appear to be in position to extend higher with Moody’s hinting of potential regional bank upgrades pending. You are currently browsing the Charted Territories blog archives for October, 2012.